Nehal has recovered from a severe bout of flu and is doing good. Am I glad! Well, I am yet to recover from a severe throat infection. I have never been so sick in a long long time. With absolutely no appetite, I have been living off soups and rasam these past few days. I feel much better since the weekend. Hopefully should be back to my normal routine this week. A quick breakfast/evening tiffin prepared with left over idlis for one of those not-feeling-good days. Similar to Idli Upma with a slight variation. 2 Add chopped onions and saute till they turn transparent. Add coriander pwd and combine. Add the ground roasted dal pwd and combine. Add the crumbled idlis and combine. Cook for a mt. Adjust salt, if required. 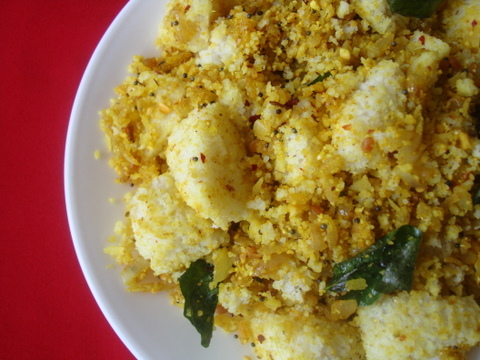 wow with left over idlis …….. its a wonderful idea sailu …. hope you and Nehal are doing good after the illness….do take care. Pic look tempting…will wait for ur future mouth watering recipes after your recovery…..GET WELL SOON. Looks delicious! We missed the mouth-watering recipes for more than a week. Take Care!! Hi, I am a fan of yours and have improved a lot in cooking, following your step by step procedures. In a way you have been my guru in cooking. Thanks a ton for sharing all these wonderful yet simple recipes. Had not seen your posting for sometime now and was wondering if you have taken a break to travel abroad. Sorry to know that you and Nehal were not keeping well. Do take care. Our best wishes to you and your family to be in perfect health. Believe me, you make a lot of difference in lot of peoples life by being so selfless in posting all your wonderful recipes. Your recipes are always rocking!!!!!! Do take care of your health, get well sooooooooooooooooooon…. Idly Upma looks so good Sailaja. Hi Sailu, hope that you feel better soon. Rest is the best medicine but missing you and your updates so much. Hi sailu, great recipe as always. Glad to know that u and nehal have recovered. Expect to see more of u. Sorry to hear about Nehal and you. Get well soon. I check your website daily and was wondering what was keeping you from posting wonderful recipes and stunning pictures. Take care. Relieved to know that you and Nehal have recovered from ailments. I was actually wondering why there were no new posts from you for quite some time. Missed you. Glad that you are back. How are you & Nehal feeling now?Hope you have recovered from the Flu.Take care. Looks like you haven’t recovered still, I don’t see any new posts. Please take care of your health and get well soooooooooooooooooon…. I like your website a lot. I like your creativity and interest towards both food and life. I keep logging back in many times in a day to see if there is any new post.. i understand you were ill and getting back. take care and keep posting your wonderful recipes.You have a beautiful time. i am a regular visitor of your website and was wondering why there is break in between, especially for ganesh festival, but came to know from the above comments that you and Nehal were ill and seems to be recovered. But recovery itself bring other problems with it, you may still need much rest, especially Nehal. Do take good care of both of you and may God help you in bringing your health back to normal. Hi sailu,thank u so much i learnt lots of recepies through ur website.